The symptoms of insomnia include daytime fatigue, inability to fall asleep, waking frequently during the night or waking up early in the morning. There are two basic types, primary and secondary insomnia. Primary is when the inability to sleep is not a symptom of another illness or a side effect of a medication. Secondary is when inability to sleep is actually a symptom of another problem. In addition to insomnia symptoms, people may suffer from complications. Although the body requires a good amount of sleep, it is possible for it to function normally with a limited amount. For example, as little as 4.5 to 5 hours of sleep per night is sometimes enough to prevent future health problems. But, sometimes complications occur. It is usually those complications that send people to see their doctors. Increased risk of high blood pressure – whether it is a symptom or a cause is again unclear, but people that suffer from the symptoms of insomnia often suffer from high blood pressure, too. Basically, there are a wide array of disorders that are interconnected. Being overweight or obese increases a person’s risk of high blood pressure, heart disease, type II diabetes and poor immune system function. When all or most of these health problems are present, doctors and researchers describe the condition as metabolic disorder. Being overweight interferes with a person’s ability to sleep well. 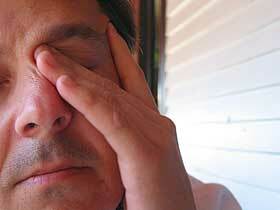 Obesity increases the risk of sleep apneas. So, the primary insomnia symptoms are dangerous and the health problems that often accompany poor sleep are dangerous, too. For acute problems of short duration, sleeping pills may be prescribed. But, as a long term solution, they are rarely recommended to deal with the symptoms of insomnia. Side effects are common and the dangers are similar to those that accompany lack of sleep. For example, taking a sleeping pill and then failing to get a full 8 hours of sleep could cause an early morning traffic accident or poor performance at work. Other treatments may be effective, especially when a cause can be identified. For example, if a sleep apnea is the cause, sleeping at a 30% angle, on one’s side, using a CPAP machine or even surgery may be effective for correcting the problem and resolving the person’s inability to sleep. Other insomnia symptoms are those of sleep deprivation. They include irritability, memory lapses, hallucinations, tremors and muscle aches. Dizziness, nausea, dry mouth, headaches and twitches are other possible effects. The body simply cannot function without adequate healthy sleep. It is the time when tiny amounts of cellular damage that occur during the day are repaired. In some cases, it takes only lifestyle changes to address the causes and symptoms of insomnia. For example, turning the TV off might be all that is necessary.